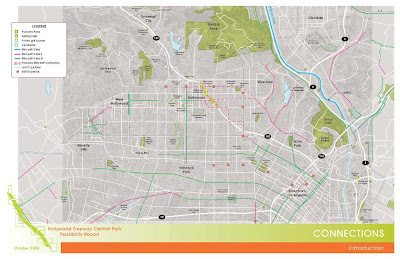 One project in this mix with some real traction is the Hollywood Freeway Central Park - which in 2008 developed a initial feasibility study with AECOM as the consultant. The report goes through a mix of analysis and exploration, along with a public involvement process. 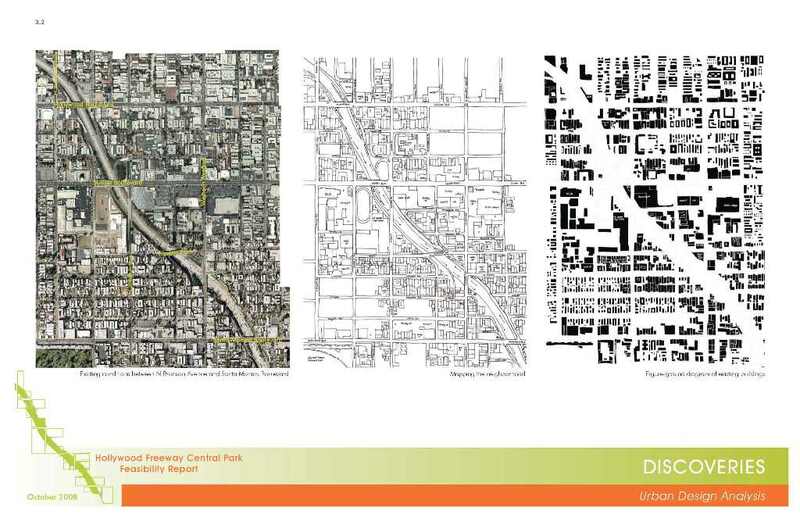 The idea of knitting the fabric of two severed neighborhoods with elevated park space drives the significant cost for capping projects - aiming to fix some of the damage done in the initial freeway routing. 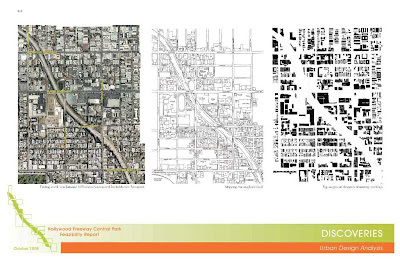 A range of graphics include some typical analysis - as I'm always interested in seeing the old chestnuts like figure-ground analysis in urban design studies. 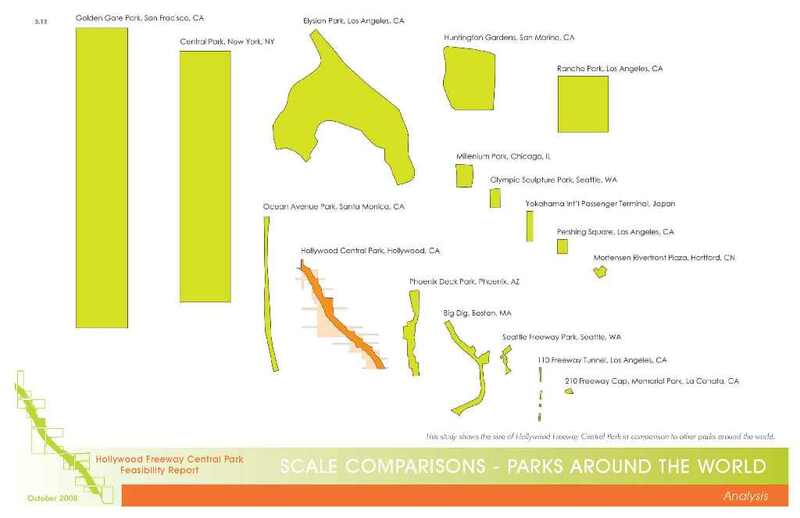 I'm a fan of the figure ground as a tool, and this case in point reinforces the power of this tool to 'detach' from a system and make key connections. 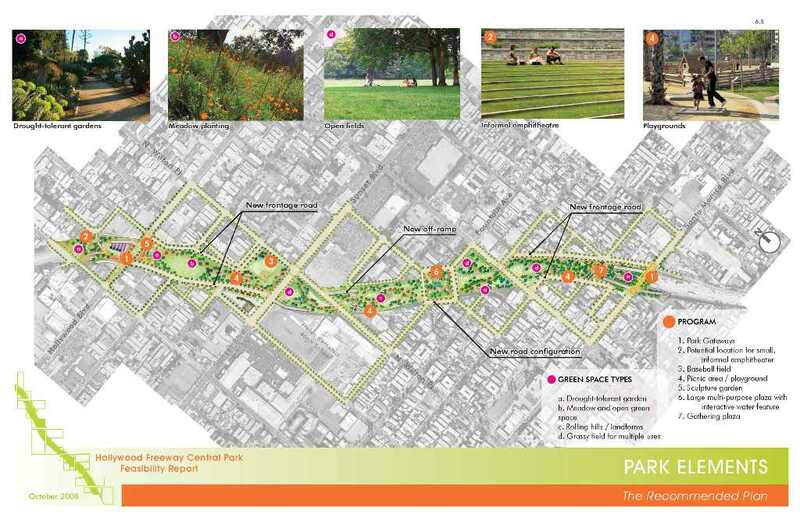 In this case, most of these retain some of the key crossings... but take advantage of the ability to reorient circulation to create interesting spaces and maximize connectivity. 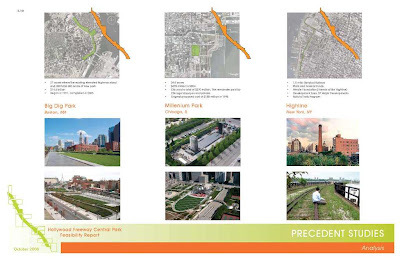 A range of precedent studies included notable capping projects like Millennium Park (Chicago), Big Dig Park (Boston), Olympic Sculpture Park (Seattle), and others showing examples of spanning roadways to connect disparate portions of the urban fabric. Another graphic that seems to be in vogue (drawing from some of the scalar diagrams of the book Large Parks) - giving a sense of size and proportion to other established large urban park spaces. The final concept creates somewhat of a linear park corridor, which is really a series of medium sized park periodically bisected with crossroads. The programs run the gamut from passive spaces to sports fields, sculpture gardens to plazas offering a range of uses - connected by pathways and crossings. There seems to be a range of possible options to use this new space that have been explored in many project proposals - from agriculture to mixed use infill - meaning a park is merely one option. 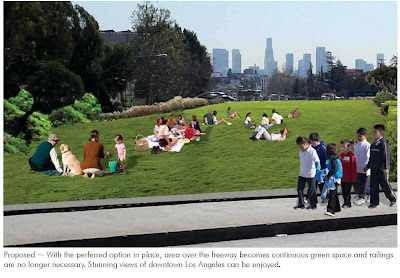 The simple photo-montage graphics show some dramatic before and after shots of the reclaimed space atop what was essentially a dead zone below. Obviously time and economics will tell if this is a viable strategy to implement in our cities. 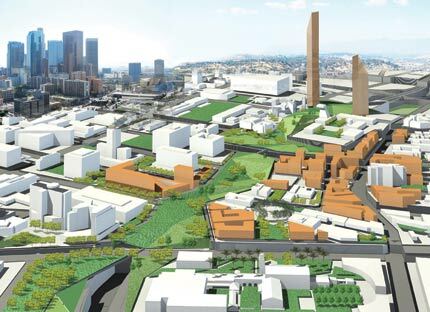 The experience with the costly and issue-prone Big Dig has soured some on the idea, although the spaces that are emerging atop the depressed roadway is starting to pay dividends for a new public realm. 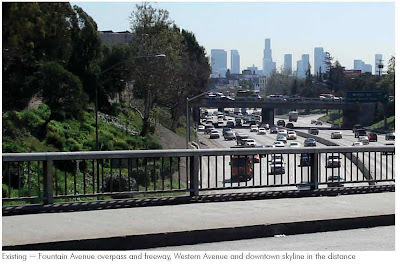 Burying is one thing - spanning and capping is another, taking advantage of the existing configuration of roadway 'canyons' to reconnect spaces. 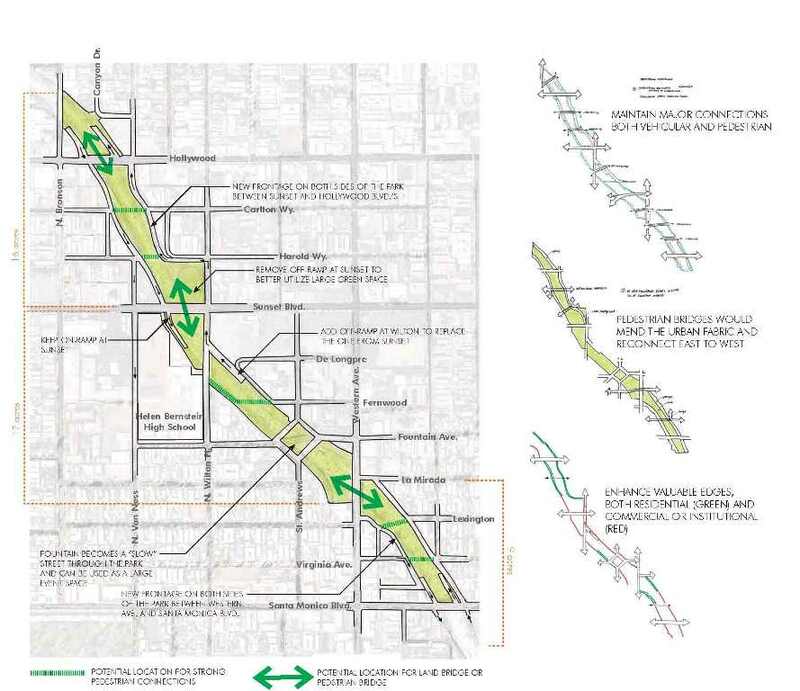 My thought is that it is not the silver bullet, (more like a really expensive band-aid) but necessary (in lieu of freeway removal altogether) to strategically reconnect areas of the urban fabric that have been severed to a degree where health and livability are forever degraded. The expense means a surgical analysis is necessary to determine where to locate these for maximum impact, as well as how to program the spaces appropriately to make use of the space. There has been much renewed talk about this, so I imagine we will see more of these in the not-so-distant-future. And I think that's a good sign. Download the entire report here for the full story. People will face problem about landscape because population is increasing and lands are limited. Seems like a great idea, I hope something good comes from this study. I have seen several successful examples of this in Chicago and Barcelona. 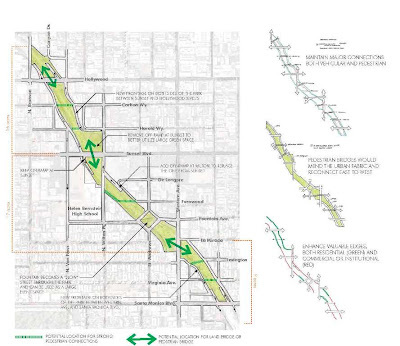 Its interesting how freeways are recessed like that. It makes you wonder what was there before there was a freeway.